With considerable manpower, effort, research, and an eager ear to the wants & needs of our customers, PRINOTH set out as its objective the creation of new benchmarks for crawler carrier productivity. PRINOTH says its innovative R&D gives the PANTHER T7R a payload capacity on par with the industry, and an overall speed that literally leaves the competition in its tracks. 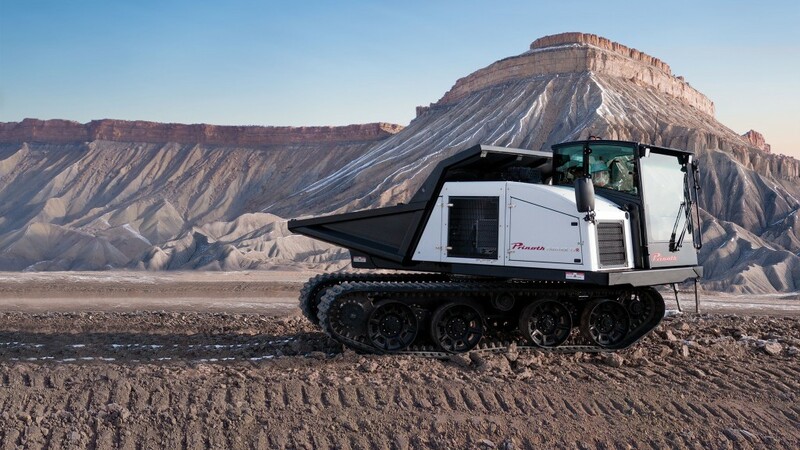 Unmatched performance and industry-standard payload capacity means the PANTHER T7R can boast a 31% superiority in overall productivity, once again burying all challengers. Creating a machine with such an enviable low cost of ownership is no mean feat and required the rigorous application of PRINOTH's dedicated hands-on philosophy to planning, design, testing & refinement. This resulted into great advantages for owners. For one, this model's fuel autonomy is considerably superior and will easily allow contractors to work through a whole day, even a long one, without needing to refuel.Additionally, the vehicle is also under 2.5 m wide, which complies with standard transportation regulations and thus saves companies money and makes transporting the vehicle from one site to another much easier. All told, owners and operators of the new PRINOTH T7R will benefit from best-in-class productivity levels. Off-road mobility backed by a robust product is a commitment to excellence that goes a long way at PRINOTH. For the past three years, PRINOTH has been participating in EU-funded Project in a consortium of European forestry institutes together with the leading cut-to-length forestry OEM PONSSE to develop a low-impact forwarder. PRINOTH was chosen to supply the undercarriage to the ground-breaking OnTrack Forwarder, a prototype timber-carrier with remarkable speed & traction ability developed with the financial support of the European Union. The PANTHER T7R widens PRINOTH's comfortable margins of safety through the constant revaluation and evolution of our design and ergonomics. Its unrestricted cab views will provide safety and security for operators and other workers on the jobsite. Accidents can seriously impact productivity, and safety innovation is an excellent way to prevent them. Driver comfort and ease-of-control directly impact maneuverability and safety, so like our entire model range,the T7R also includes a combined pedal & steering wheel thus adding a level of intuitive operation that adds security to everyone in, and out of the vehicle. It is clear; when it comes to safety and comfort, we leave nothing to chance. With the T7R the PANTHER family graduates to all of the performance and sustainability standards of the EUROMOT Stage 5 Engine. Cleaner, more efficient, and much better for the planet, it is part of our commitment as our Clean Motion philosophy, ensuring PRINOTH leads and never follows when it comes to protecting the environment on which our industry depends. PRINOTH understands that its machines are made for people - owners, operators, and those who keep our reliable crawler carriers running over any terrain and in all conditions. Which is why the PANTHER T7R includes maintenance-friendly easy-access features such as human height filters and oil gauges - so operators spend less time getting ready for the job and more time getting the job done. Another great reason the T7R is going to be in high demand for years to come and that PRINOTH will continue to lead innovation and excellence in the design and manufacture of tracked vehicles.